As Commander of the Thunderbirds, Lt. Colonel Ron Mumm asked Paul Fisher to design a pen with a "gripping knob" to allow easy removal and replacement from the small, lower leg pocket of the pilots' flight suits. Today, this pen is the official writing instrument of Thunderbirds pilots. 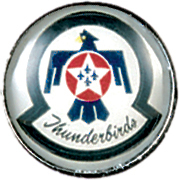 The Thunderbirds logo sits atop the gripping knob of the pen. Otherwise it's a regular AG7 model pen as used on all the manned space flights.